Thank you for signing-up for WordPress Basics. This workshop will serve as an introduction on the WordPress platform through a number of examples in a teaching and learning context as well as numerous opportunities for hands-on practice. Before you come to the workshop, we need you to create your account and blog at http://blogs.ubc.ca if you have not made one before. Please see the instructions below. We also encourage you to take this time to explore WordPress to get yourself familiar with the platform. Go to https://blogs.ubc.ca/ (bookmark this for the future!) >> click on the LOGIN button and enter your CWL information. The CWL button is located on the right-hand side of the screen. 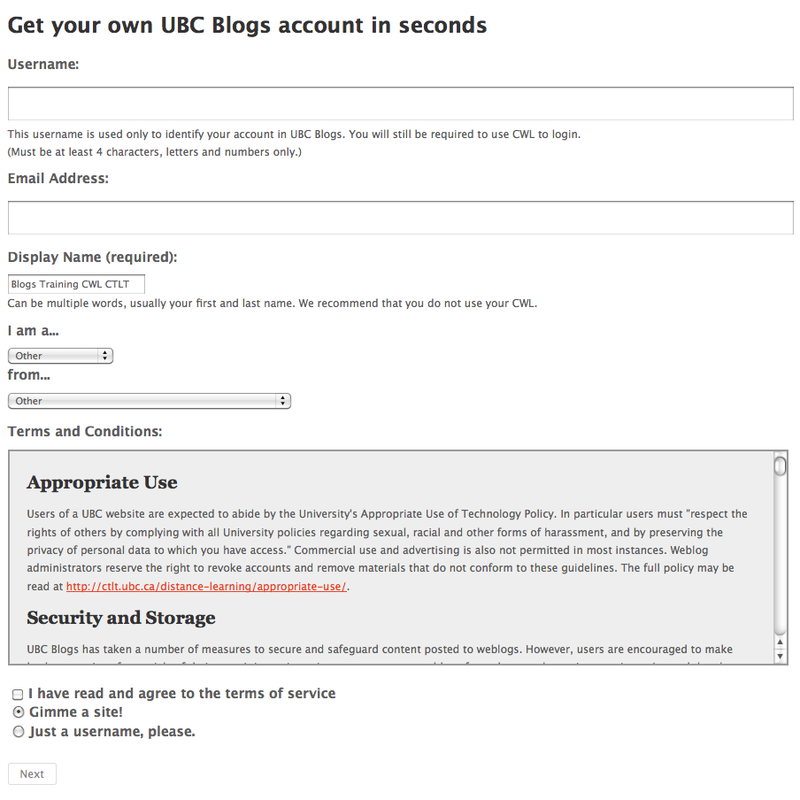 Use your CWL to sign-up for UBC Blogs. Agree to to the terms: "I have read and agree to the terms of service"
Choose a Site Name and Site Title. Note: The Site Name will become part of your URL and cannot be changed. The privacy settings control your site's visibility. You can decide if you would like your blog to be visible to everyone, including search engines. 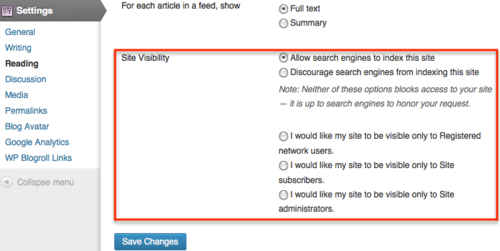 If you don't want your blog available to search engines you can block them, but allow normal visitors to see your site. From the Dashboard, under the Settings drop-down menu, click Reading. Browse through the Site Visibility settings at the bottom of the page and select the most appropriate settings for your webspace. This is the setting used by most blogs. It lets everyone read your blog and allows your blog to be included in search engines and other content sites. The site will be accessible to everybody but will not be searchable through search engines. 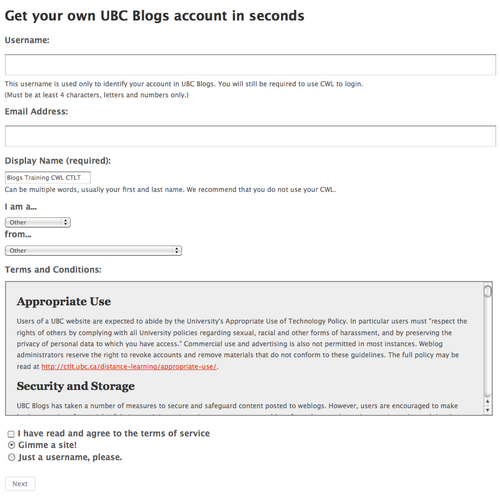 Only those with a CWL and a UBC Blogs account will be able to visit your site. 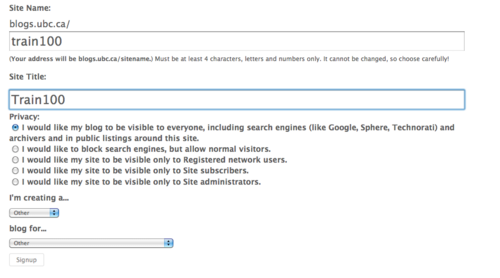 Only people that are added to your blog as a user will be able to access the site. 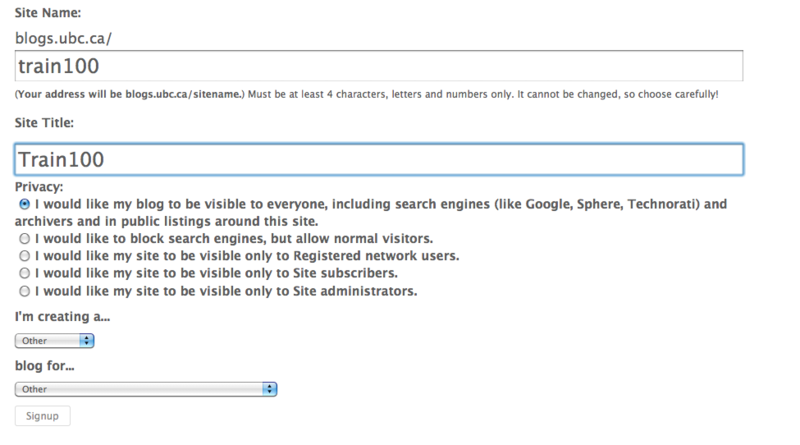 Only you and other users with site administrator roles will be able to access the site. Sites in development are usually only visible to site administrators in the beginning. Course blogs that are restricted to only class participants are only visible to site subscribers. Community sites with content intended for visitors outside of the UBC community will allow search engines to index their site. This page was last edited on 2 January 2013, at 20:51.